After having digitised the original artwork, the image is uploaded to the embroidery machine for stitching. 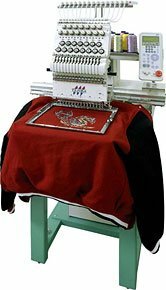 At Identity we make use of Tajima Embroidery Machines exclusively. Tajima is today the most respected and generally recognised as being the very best embroidery machine available on the market. To produce high quality embroidery, one needs the best possible quality digitizing and to obtain the best quality digitizing one needs the highest possible resolution and best quality original artwork. Quality craftsmanship and customer satisfaction has always been our top priority. 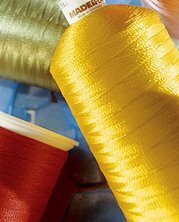 We at Identity are dedicated to giving our clients top quality embroidery with smooth and stitch perfect work. Corporate clients demand high standards and spend vasts amounts of money on company branding, that deserves the best quality embroidery of their company logo's and corporate image. Identity offers embroidery services of the highest quality and standards. Because we areparents ourselves, we realise the need for embroidery, not only as a company marketing and branding tool, but also for personal identity, children's clothing, towels, bedding, etc, we do work for individuals as well. For embroidery digitizing done right, done fast and at an affordable price, contact Identity.